4. A. various. B. similar. C. same. 83. Could / give me / information? 1. Who was invented the telephone? 77. ‘Can I borrow your bike, Nga? 9. I need some help with the table. Grade 8 THE FIRST SEMESTER EXAM 22. 1 2 3 4 5 Mistake …………..
2. A. how B. grow C. town D. cow 3. 14 1. ..................... .... 2. 26. Keiko has $100. Betty has $75. Part 1. (10 points) 56. B 57. A 58. 1. Look! / sun / set / mountains 2. SECTION B: VOCABULARY & GRAMMAR IV. 7. “I passed the TOEFL test, Mom. D. those who travel to London. 69. A. on behalf of B. on account of C.
47. A. Might B. Should C. Would D.
A. me B. for C. me on D. on me 12. C. naturally fertilizing the soil. 4. A. up B. out C. over D. into 5. 4. their --> its 5. up --> down 6. 4. It was raining cats and dogs. 5. 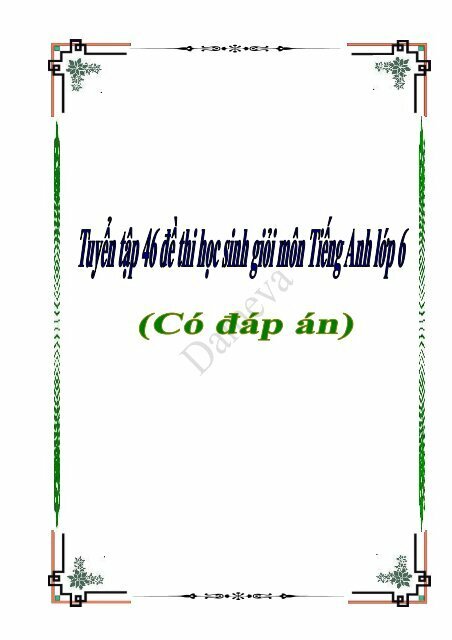 Part III (1x 5= 5 điểm) 1. C 2. 6. A. over B. against C. through D.
18. She was a hungry as a _______. Choosing clothes can be difficult. C. Advanced tools of measurements. Page 3/7 Your answers: 1 ………. 46. A. worries B. cares C. fears D.